AppArmor Mobile Safety Blog | New Feature: Send Push Notifications by Emailing Your Safety App! New Feature: Send Push Notifications by Emailing Your Safety App! Have you been looking for an easy way to integrate Push Notifications with your existing emergency notification system? If so, you'll know that it can be difficult to get different systems to communicate. APIs, endpoints, authentication, and other technical barriers can over-complicate the situation and be expensive. There must be an easier way. Today, AppArmor is pleased to announce a new feature. It's called "Email-to-Push". Here's how it works: your safety app gets a dedicated email address provided by AppArmor. Then, you just subscribe this email address to your existing emergency notification system. Email messages sent to the dedicated address are instantly sent to your safety app users as push notifications. Voila, integration done! 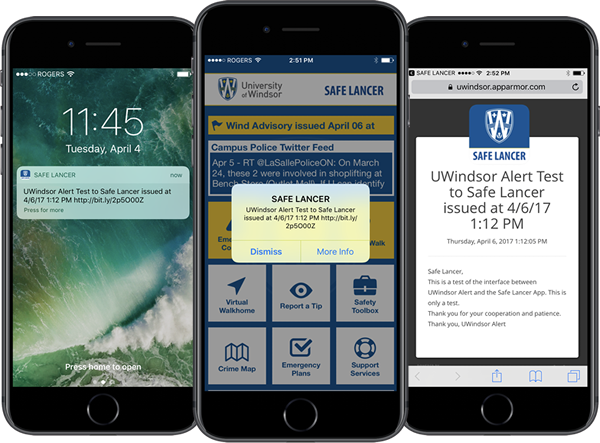 This new feature was developed in collaboration with the University of Windsor for implementation into their "Safe Lancer" app developed by AppArmor. The University of Windsor uses an emergency notification system that didn't offer any out-of-box methods for integration. To resolve the problem, the AppArmor team went into the skunk-works to find a creative solution. Email-to-Push was the answer! 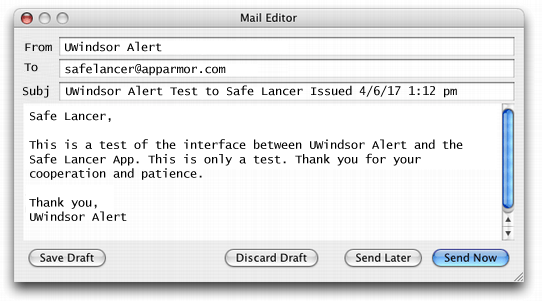 Below are some screenshots showing test messages received on the Safe Lancer app via Push Notification. You'll notice that the full email body is available to the recipient when they tap the "More Info" button. We're thrilled to make this new feature available to all existing AppArmor clients for free for a limited time. If you are interested in implementing, please contact our team for help configuring. Special thanks to Chris Zelezney at University of Windsor for collaborating with AppArmor on this project. We welcome the opportunity to work with our clients. If you have an idea, reach out to us today.